What’s the point? | Everything Mayo! Honestly, what is the point of my writing another post that explains the disappointment of being knocked out to Galway? Again. Having to listen to the other half boast about Comer and co. Again. Talking in paragraphs about our great resilience in the qualifiers, again. Writing pieces for the blog was just pointless, I could just copy and paste an article from last year, tweak a few words and hey presto. But then, last Saturday against Tipp, that all changed. We went three points down and it looked as though that was it. The wheels had come rolling off, the goose was cooked. In my head I had already started scribbling down the obituary for this Mayo football team: 2011-2018, RIP. James Durcan’s goal changed the whole momentum of that game. I honestly believe if that doesn’t go in, we go out. One thing I miss about being a sports reporter in Mayo is getting to see all the stars coming through. You don’t know the joy of witnessing the likes of Diarmuid O’Connor playing at club level and just knowing that his name is going to be on everyone’s lips in a year or two. I was hearing James Durcan’s name pop up all the time in the several groupchats I’m involved in. “He’s tearing it up for Mitchels, he’s the extra forward we’ve been crying out for”. And whether he meant that goal or not, he has now become another player who the fans will pile their hopes and dreams upon. 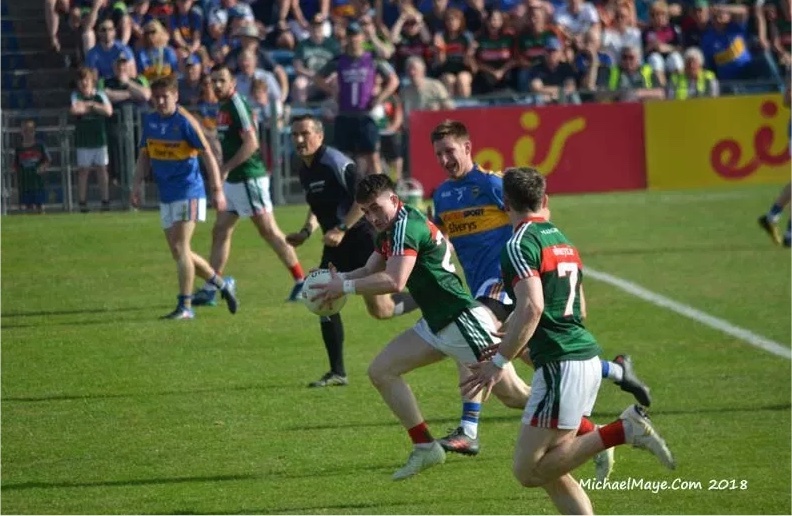 Last Saturday’s performance and particularly Durcan’s goal has sparked an ongoing question in my mind that we need to address: Why does it take Rochford’s Mayo team so long to get into action? It was the same last year against Derry and Cork. It’s only really when our backs are against the wall, properly stuck to the plaster, that we decide to kick it up a notch and seal the victory. Durcan’s goal went in and it was as if the group on the field just went, ‘We’re Mayo, what are we playing at’ and everything started to fall into place. Mayo remind me of that auld fella in a bar when a sing-song breaks out. The one that is a fantastic singer and everyone else in the pub knows it. They ask him to sing a song and he refuses a few times. Eventually, at the end of the night, he blasts out Spancil Hill and leaves the whole place on its knees. And it’s beautifully torturous. Scrolling through Twitter after the Tipp game and I was seeing tweets like “well worth the money in”. You could pay €80 for a Mayo ticket in the qualifiers and get your money’s worth. It’s not a game of football when they play anymore, it’s a full on Shakespearian play (which sadly has turned into a Shakespearian tragedy in September over the last few years). There’s the optimistic start, the rocky middle, the climax and the happy ending. God help the men who play Cillian, Aidan, Boyler, McLoughlin, Clarke and the others when they turn it into a film. They’ll have some amount of a script to learn off. You come out of Mayo games and you honestly feel like you just spent an hour and a half on an extreme water slide or on a roller-coaster ride. Then there is the other side of the coin to the ‘leave it ‘til last minute’ approach which we have fallen into, which is simply that this Mayo team must be absolutely shattered. I read some stat before last Saturday’s game that in this current era (i.e. from 2011 onwards) the team have played something like 48 Championship games, Tipp being the 48th. And in that time we have been beaten by three teams only: Kerry, Dublin and Galway. You must applaud the sheer determination and bounce-back-ability of this Mayo team. As well as those two points, if you consider Durcan’s goal to be the turning point in the game, it was just the bit of luck we needed this year. We’ve been so unlucky, firstly losing Tom Parsons and then, in Thurles, Seamus O’Shea. For once, we just needed the gods to shine down on us. Sadly it came at the expense of a Tipperary side who really had put it up to us for a good 50 minutes. Or, if Durcan actually meant the shot and is confident and accurate enough to ping it in the net from those sort of angles, we could do with one of them each game, please! Either way, when we were up against the ropes, I remember praying that my next article for the blog – which was going to be this week regardless – would be a happy one. Thankfully, it is. I honestly couldn’t think what I’d do with myself if Mayo were knocked out on Saturday. The only thing that got me through work was the thought of Thurles. Is that sad? If so, I’m a saddo, the biggest one going and I don’t even care. Because you know why? The thought of going again in Round 3 is what’s keeping me going through this week of work. In the depths of winter, we would have bitten your hand off to be still involved in July. Sure, we’d love to be in Galway’s position but I’d rather be testing out my heart beat and blood pressure week in, week out then to have it untouched. Side Note: It’s still ticking away for the moment, it’s a good thing herself is a nurse. This great Dublin team – they are our enemies, but it is allowed to admire their greatness – also began their great run in 2011, winning their first of many successive Leinster titles in that time. It’s sad that one team has always been that little, tiny bit better than the other when it has come down to it. But there’s no point looking back. It’s all about looking forward and so we march on now to face Kildare in Newbridge on Saturday evening. Taking one game at a time, of course, but knowing that we are two more steps away from the Super 8s. It wasn’t too long ago that last we faced the Lilywhites in a crucial qualifying game. We’ll be hoping for the same outcome as we achieved in the 2016 game. The post What’s the point? appeared first on Mayo GAA Blog.